PPS MMR – WMS Legal Approval Recieved! We have received a much anticipated WMS Legal approval (1/28/14) to move ahead with the game which triggers puchase of parts (which we have already been doing in anticipation), as well as to production. Roger Sharpe (WMS) has played the game and has agreed that the game plays well and any items that needed to be addressed are accounted for. The game plays correctly relative to the original game and that is a key criterion to moving forward. So, the team is now busy procuring parts as welll as finalizing the last revision of the electronics. Artwork has been completed and the game elements have passed the test with WMS. We will update you more, but the focus is on procuring parts (not building games just yet!) and then moving to a pre-production and then production in a couple of months. Given that we are still working on getting some of the prototypes together which will take several weeks, we will not be freezing any deposits until we have games readily available to play as well as things like the choice of gold trim, etc. This entry was posted in Medieval Madness Remake! (MMR) on January 28, 2014 by admin. PPS MMR Customer Technical Support – Lloyd Olson on the team! Planetary Pinball Supply with Chicago Gaming is happy to announce that Lloyd Olson will be on board with us to provide installation and technical support for the Medieval Madness Remake (MMR)! 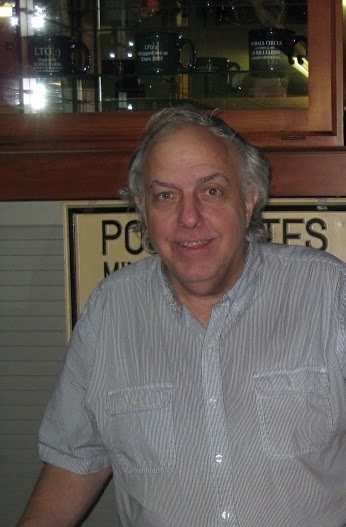 Lloyd is a fixture in the pinball community and on most pinball forums, as well as provides game technical support as well as parts support for a number of other pinball companies. We are fortunate to have his knowledge and expertise available to us to help insure that our customer setup and installation, configuration and settings, and any technical customer needs are addressed quickly and correctly. Lloyd complements the rest of the support resources which PPS is putting in place now (help ticket system, phone access, factory technical support, etc) in advance of the MMR release expected in Q2 2014. Lloyd will have a MMR at his headquarters as well as various assemblies as needed to insure that he can complement the rest of the MMR support team and of course is very familiar with the original Medieval Madness game which the MMR shares many elements. Of course Lloyd continues to support what he supports today as his continued experience with all game platforms, parts, and interactions within forums only enhances and helps the pinball community overall. This entry was posted in Medieval Madness Remake! (MMR) on January 18, 2014 by admin. The feedback was very positive that that it’s a very strong product, and reviewed the artwork in detail, played the game in detail, made some minor tweaks of things, and that there is nothing he sees that would prevent the MMR from moving forward. The next step in the process is to get WMS Legal over (also our interface on the Legal Side) to go thru the reviews and move to the next step. Roger’s view is that the design is very good, and likes the innovation, and was very positive. Next step is the WMS Legal Team come over to see the game in the next week or two and then get a legal release to move forward into manufacturing in Q2. WMS will stay involved with reviews as we go to final final product, but all is good and we just follow the process as it gets refined as we go. I will get documentation as I can, but Doug was out of town today but I will get either pic or video of Roger playing the game to document the review. This entry was posted in Medieval Madness Remake! (MMR) on January 15, 2014 by admin. Game progresses well, the team has ordered parts signaling a shift towards manufacturing, assembly fabrication steps being developed, and moving towards the acquisition of parts and production. Entering final stages for electronics revisions, test feedback, etc. The first proto game is complete and playing well with Audio and Video with all parts assembled with the upgraded Electronics. Minor code changes as hardware revisions are produced, etc, but overall the team is confident in the ability for the game and work as expected. Parts have been ordered and are coming in now for the LE build. Electronics – most PCB’s are on final or next to final release. Audio – we have the original uncompressed audio files which will result in superior sound quality vis-a-vis the original Medieval game – this will result in much better quality as original Medieval Madness audio was compressed and resulted in lower sampling rate that we will be able to provide. Artwork – playfield and cabinet artwork have gone thru multiple revisions to get colors adjusted and refined/tweaked to get the best quality out. We are on 4th iteration of the playfield artwork and have produced both playfield and cabinet art and are in good shape for artwork. Trim Finish – we are working thru LE Gold Finish choices and will provide pictures and some samples of the finish as needed in time for anyone to be able to modify their choice between silver vs gold trim – probably late January for this update. WMS Approval Process – we are the first ever to go thru this with WMS, so Roger Sharpe (PPS’s WMS Business Interface) is scheduled for the end of the first week of January (1/7) to review the game, as well as play the game. We believe the process will yield a positive result and then it’s just exactly what Roger and the legal team need to officially approve (which could be right then and there, to having a list of conditional approvals based on any items that need to be addressed – like logo or trademark placement, etc). We are confident that the approval will be forthcoming. A Note about Deposits: for those who have MMR deposits – don’t stress about the timing, we have every $ in our PPS MMR Account, and we are also not going to make the deposits non-refundable until two conditions a) that we have the WMS ‘approval’ signaling that we are ok to move ahead with full production (which we expect), as well as b) that you have enough information about the game – videos, pictures, FAQ, player reports, etc. Additionally, we will give you a week or so notice AFTER we feel the above has happened to insure that you are confident about your purchase. In any event none of this has any effect on the schedule or the work, just that you have time to review and see the progress, and move forward with us being fully in view of the product. So, don’t worry!! Customer Feedback – thanks to all of you who reach out or ask questions – you can contact us at mmr@planetarypinball.com or call us on the MMR hotline, etc. We are capturing your inputs and we have some surprises in store for you for placing your confidence in us … coming soon. Also, wanted to share that the sequence of building is not the same as a new game – for example the playfield and the cabinet art on the game are different than the final version, as it’s not so important to create the best photo op as replacing a playfield will consume alot of time (same with cabinet art). So while things progress, there are builds when appropriate, but otherwise variations of artwork and even assmblies may not be on the current build of the game. Sometime people get concerned but not to worry as we are moving towards a Q2 mfg date, as well as testing in Q1 so we are on track! This entry was posted in Medieval Madness Remake! (MMR) on January 4, 2014 by admin.